“On the first day of Christmas, my true love gave to me… a Partridge in a Pear Tree.” This classic carol is the inspiration for twelve whimsical creations Chef Jason Montelibano will be serving to guests at Eats Kitchen & Bar located in Hotel Irvine. And a December 1st invitation to their media tasting celebrating The Twelve Days of Christmas, was the perfect way to kick-off this month’s festivities. 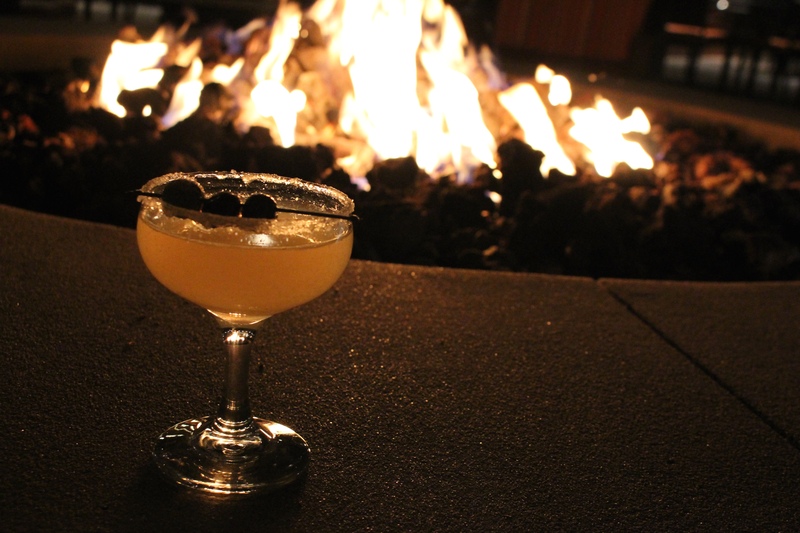 Our evening began on the restaurant patio around the fire pit with a new seasonal cocktail, The Snowflake. Served in a sugar rimmed old fashioned champagne glass, this light, refreshing and not too sweet, drink blends Blueberry Stoli, sparkling wine, a little simple syrup, a bit of lemon juice to balance it out and is garnished with three fresh blueberries. I think this would make a nice New Year’s cocktail! After a toast and some fire pit chatter, we moved inside and were seated in the warmth of the open dining room, where Chef Jason introduced us to five of the twelve creations he will be serving up one at a time, beginning Saturday, December 12 for twelve consecutive days ending on Wednesday, December 23. Join us on a photo tour of our dining experience counting down the twelve days of Christmas. While we didn’t try all twelve, what we did try made me want to return to try more. 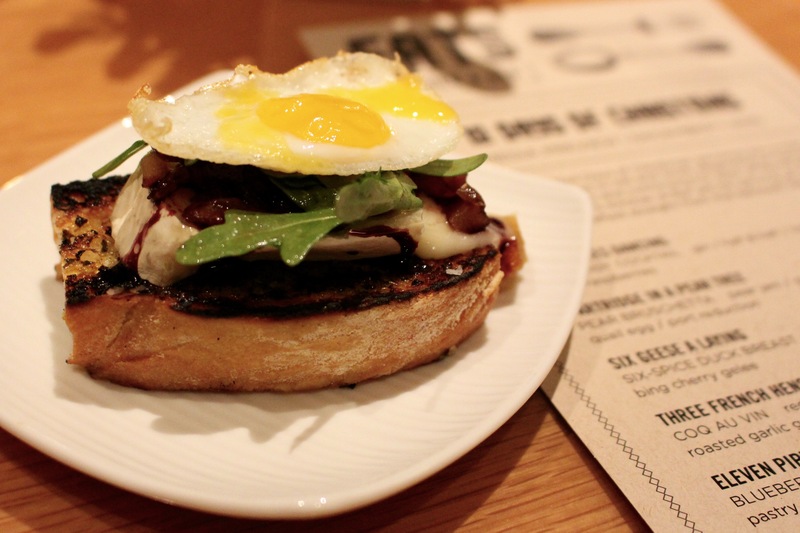 This Pear Bruschetta was topped with a pear jam made with brown sugar, vinegar and Japanese herb mustard, brie cheese, a drizzle of port reduction, served on grilled ciabatta, and finished with arugula and a quail egg. Smoky, crunchy, savory, with a hint of sweet… I could have eaten a few of these and called it a meal. Delicious. 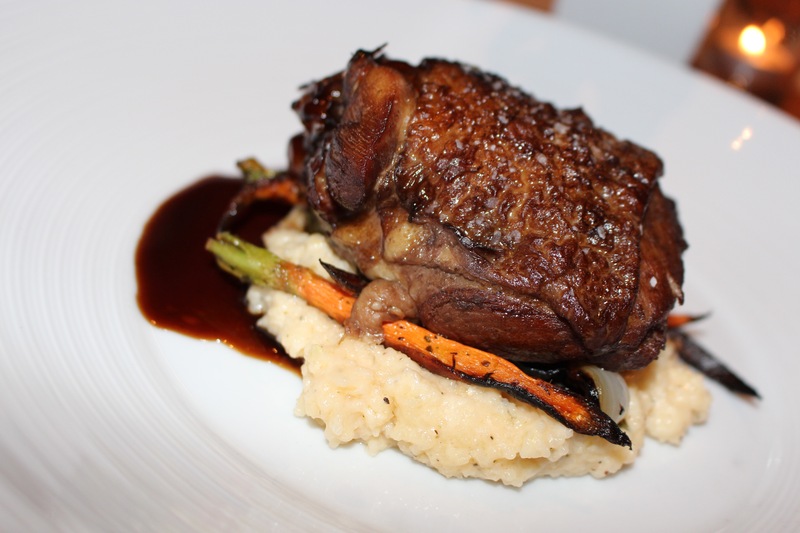 Chef Jason’s Coq Au Vin was made in the traditional style, but with Mary’s chicken legs rather than rooster, soaked in red wine with mirepoix, and cooked in a luxurious veal stock to give the sauce body. As a twist, it was served on Anson Mills White Grits with cheddar cheese. This hearty dish was finished with roasted Brussels sprouts, baby carrots, garlic and herbs. 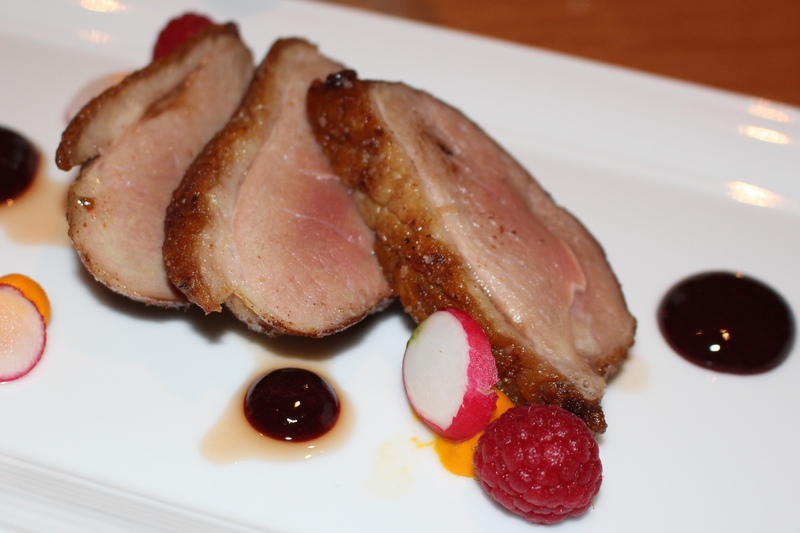 This perfectly seared duck breast was crusted with a housemade six-spice including ginger, cardamom, cinnamon, juniper berry, star anise, and black pepper and was garnished with pickled raspberries, carrot puree with thinly sliced radish, and bing cherry gelee. My favorite dish of the evening, I savored every last morsel. As one of my dining companions said, “I could eat a bowl of this carrot puree!” I could not agree more and I’d add a healthy heap of those pickled raspberries to it. 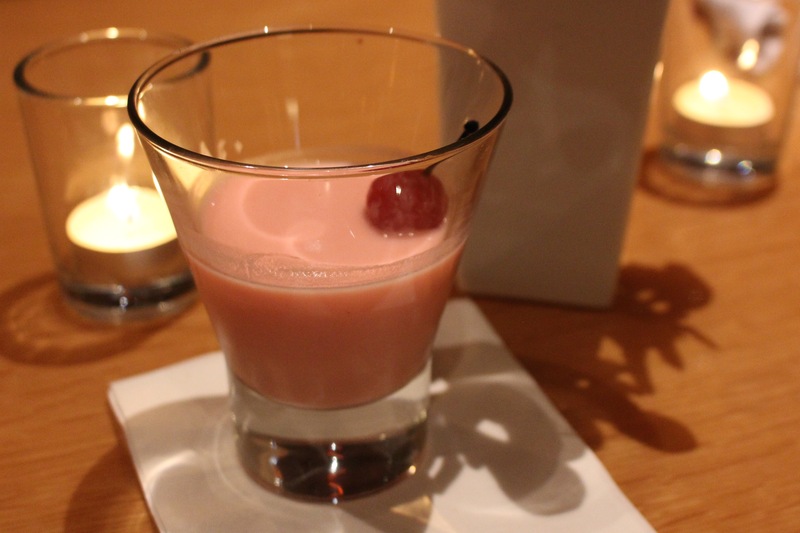 Bubble gum pink with a sweet cherry flavor, this almost dessert like cocktail is made with muddled raspberries, grenadine, and gin with a touch of cherry juice and a cherry garnish. 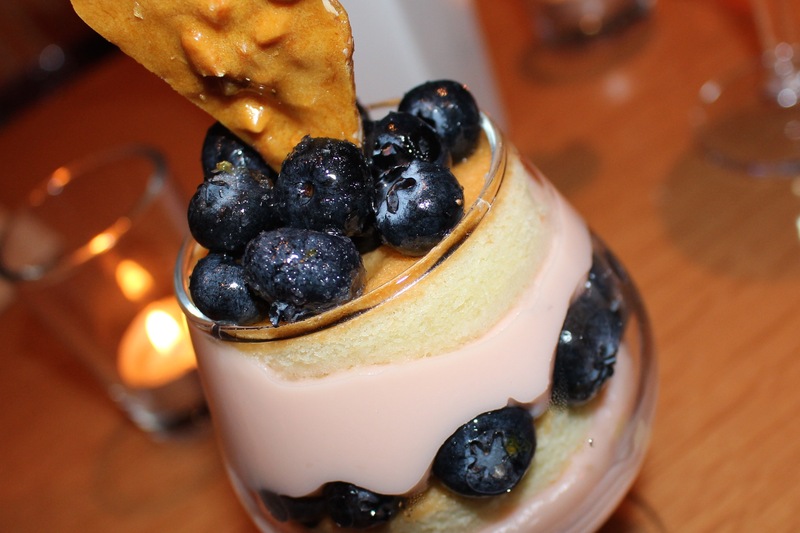 Layers of lemon chiffon cake, pastry cream made with fresh lavender buds and lemon, and macerated blueberries topped with an irresistible housemade almond brittle made for the perfect ending to our meal. I already have my eye on a couple of Chef Jason’s other creations that we didn’t get to try. Quantities are limited of each featured dish, so I recommend making a reservation for lunch or dinner requesting the dish you’d like, if have your heart set on one.